(Yet) Another year and another Transcontinental race. If you’ve already been following my past Transcontinentals, you’ve probably read my 2015 kit list (or 2014?). I will point out some changes as I explain my equipment for this year. For more photos, go check the Flickr album. And here is the same old frankenbike. A hybrid 2003-2007, Shimano 105 ”cyclocross” 2007-2009 and 2009- Campagnolo and whatever you can fit in. Parts are pretty much identical to last year. Durano 25 mm tires, PowerTap G3 rear hub and Son Delux dynamo front hub. Deluxe was serviced last winter, new chainrings were installed, had to carve one size bigger threads for frame rack mounts and rear shifters g-springs replaced. Stuff that has to be done to old and mortal bike components. I broke a Look Blade pedal last year in Italy and another this year in Finland, but I’m still using them. If they fail me for 3rd time in 2 years I’ll consider some other design. 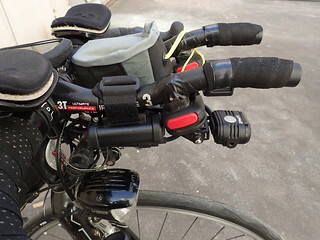 Also I added 3 mm padding to aerobars and moved them a bit outwards. My fear of the dark hasn’t gone anywhere. 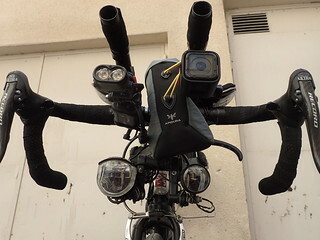 This year’s setup is Busch&Muller Luxos Iq-x and Luxos U (usb charger) dynamo lights. The combination has been surprisingly good. I can even use the Iq-x daylight and charge at the same time. Something that needed constant 30+ km/h with Luxos B. Old MyTinySun was replaced with Lupine Piko R. They finally released the ”R” of Piko, which means I now have a thumb remote for my extra front light. Which is great compared to Folkslight that was stubbornly hard to turn on/off. Also GoPro 3+ made room for GoPro Session. Worse video quality, but ease of use, no need for extra batteries, waterproof design and fast helmet mountability made it a nobrainer. More of the gadgets. I (almost) got rid of mini-usb cables. 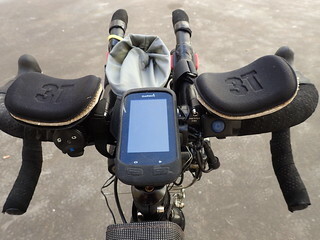 GoPro 3, Garmin 810 and MyTinySun Folkslight all used mini. Somehow it was turn to a world of difference when my 810’s mini-connector was damaged. As I was looking for replacement, a Edge 1000, I eventually replaced all other mini-usb devices. Under left pad is Edge remote and under right pad is Piko remote. Last year I had a Polar V800 (not pictured) in handlebar. The device had a broken charging connector and it was replaced. I was looking forward to use a bluetooth speed sensor, but only one available is the Wahoo RPM speed (VeloComputer may exist, but I’ve never seen one being used) and none could confirm if it works with V800 or not. I will have the V800 in my wrist this time to better track my sleep and breaks. However I’m worried I’ll get sunburns in wrist as it will wear off sun lution from area near watch. And also get absolutely filthy from the sun lotion, dust and sweat. This photo is simply cableporn. This time I don’t have to remove the connectors from Luxos U itself as it has full length cable attached to it. 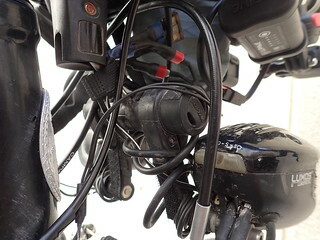 Also Iq-x has a full length cable attached. So as long as dynamo and either light works I can use that light until I find a place to check whats wrong. The rear is exactly as it was. Carradice bag and rack. B&M Secula dynamo light for visibility and Niterider Solas usb light for blinding anyone behind me. Alpkit 2-end equipment bag mounted below the Carradice. Next the ”what are you wearing” section. Same helmet, same socks, new cap (and number! ), same gloves, same shorts and same shoes. Jersey however is new and has yet to prove its worthiness. 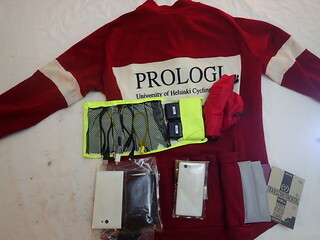 Its a long sleeve loose fit wool jersey so I could also drop my arm warmers from list. I was very pleased with the jersey during Vologda-Onego-Ladoga 1200 km brevet when temperature was around 33 celcius. It felt better than a ”technical” jersey. Yet I have no idea how its going to be in a in extreme heat and mountain climbs. Gloves are coming to end of their life cycle, but they should last this year. I think 3 years is plenty for something that takes suchs a heavy beating. Also I replaced all the paddings of my helmet(/pillow). 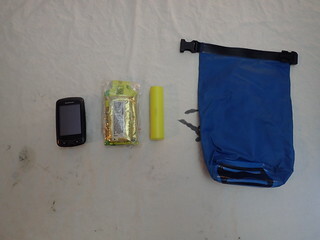 Pockets are to hold wallet and spare phone on left, chargers/cables and main mobile on the middle, Tg 3 camera (used to take these photos) on right and finally brevet card and passport in zipper pocket. 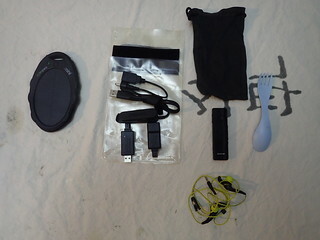 Food pouch in front will hold a power bank, charging cables and parts, spork and handsfree. 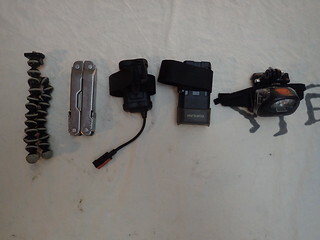 In saddle bag’s left pocket are Petzl Tikka 2 xp helmet light, Leatherman, Lupine battery, another power bank and camera pod. In Carradice main compartment are spare clothes. 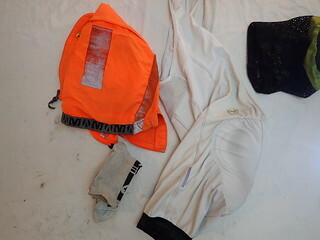 Pair of shorts, socks and a reflective vest. Still in the main compartment is spare navigator, little emergency food and yet another power bank. One of my 4 micro-usb cables is equiped with a micro-to-mini plug so I can charge 810 if needed. If there is heavy rain for several days I might need to use the 810 as 1000 can’t be charged while its raining. Otherwise I should never have to open this bag. The Carradice right pocket has musette, packable backpack, sun lotion and Assos chamois cream. I have the same Sea-to-Summit packable backpack as I had in 2014. I lost it and found it over a year later. 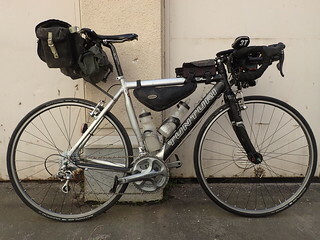 Last year’s Paris-Brest-Paris was first time I used musette actively. I have to say I really liked it. It should allow certain foods, mostly bread and fruits, be accessible while riding. 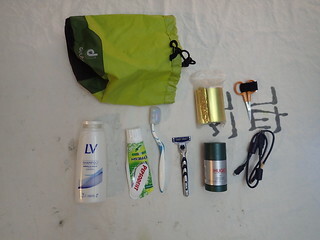 In the equipment bag are hygiene stuff, emergency blanket, scissors and … a Olympus Tg-3 charging cable. The camera’s battery last several days so I only need to charge it during longer hotel stops. 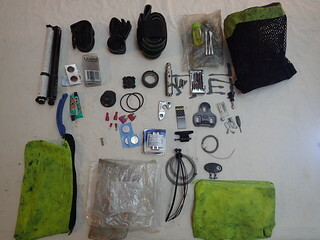 Also in the equipment bag are the ”camping” equipment and ”civilian” clothes. For sleeping I have hip-to-shoulder cut roll of bubble wrap and bag with shorts is typically used as pillow. 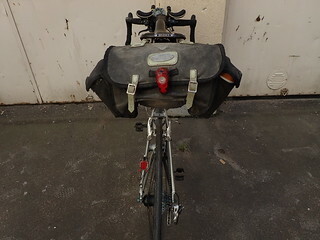 Last, but not least, is the frame bag with ”always needed” spare cloths. 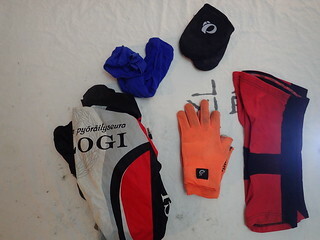 Leg warmers, wool buff, toe warmers, SealSkinz long gloves and a wind-/waterproof jacket. 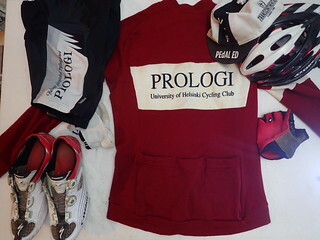 I hope the Gamex+wool jersey will be enough for even the coldest Alp downhills.